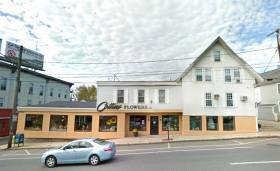 Prolman Realty, Inc. is pleased to announce the sale of 5-9 Main Street to CAZ Holdings, LLC of Andover, MA. According to Mark Prolman who represented the seller JCS Realty Corp. and assisted the buyer, “the sale of this Landmark Nashua property consists of the former Collins Flowers, Dr. Bednar’s Orthodontist practice and a 1 bedroom apartment. The new owner plans to lease the former Collins Flowers area consisting of 3,055 SF of retail, 700 SF of office, a 2 bay garage and 8 parking spaces.” Acquisition financing was provided by Enterprise Bank. According to the Hillsborough County Registry of Deeds the selling price was $535,000.00.